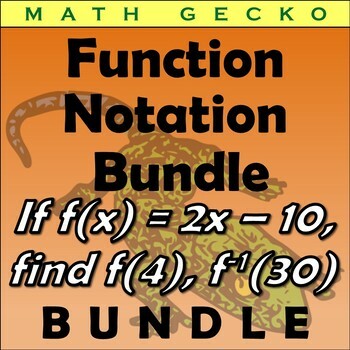 This bundle includes three Function Notation worksheets. Each is structured to allow students to check the accuracy of their calculations without an answer key via riddles that students can solve. 1. Calculate Function Values challenges student to use function notation to evaluate various expressions, including decimals and operations using squares and square roots. 2. Inverse Function Values requires students to solve functions "backwards," starting with an output value and manipulating the expression to find the input values. Expressions include fractions, binomials and radicals. 3. Interpret Function Expressions requires students to think more deeply about the meaning of functions and inverse functions, and involves no numerical or algebraic calculations, but rather logic skills as applied to function notation.